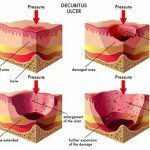 Decubitus ulcers (pressure ulcers; pressure sores; bedsores) can be extremely painful and treatment often requires proper support surfaces when the patient is immobilized. Recently, a nursing scholar from Rutgers University-Camden developed a new algorithm to assist healthcare providers in selecting the ideal surface to meet the specific needs of immobile and inactive patients. In an effort involving a research team, nursing professor and scholar Janet Beitz developed an algorithmic method for choosing an effective surface using clinical evidence. In a recent interview, Beitz stated, “There is considerable need to guide the decision on support surfaces. A standard mattress is not designed to prevent or treat pressure ulcers because it is the kind of mattress you sleep on at home. There are mattresses specifically made for prevention and it is so important to get the patient on the right surface,” to improve care. Bedsores can develop quickly when prolonged pressure remains on the skin and underlying tissue, restricting blood flow circulation to the area. If there is not adequate blood flow on a continuous basis to the area, skin can easily die, which starts the formation of an ulcer. Normally, humans tend to shift their weight by moving or walking. These processes protect the skin and its underlying tissue from damage. Pressure ulcers tend to develop on individuals who are immobilized because of any number of conditions including paralysis, post-surgery or other medical issue that makes it difficult to move without assistance. Numerous support services have been effective at reducing the development of bedsores and have proved positive in the healing process of existing sores. Until the development of the algorithm, choosing the best support surface was often difficult when matching the needs of the individual patient. Because of that, experts including Beitz from the Wound, Ostomy and Continence Nurses Society developed the algorithm. Medical technology provides various support surface options that are used to effectively treat and prevent the development of bedsores. Some of these include specialized pressure-redistributing mattresses, friction management devices and other options that control moisture. Clinicians have had access to various seat cushions, mattress overlays, specialized mattresses and specialty beds designed to provide the body support while in a chair or bed. Specifically, the support surfaces relieve or reduce pressure from certain areas of the body, especially areas with bony prominences, to minimize pressure against the skin when seated or lying in bed. The reduction or relief of pressure allows existing bedsores to heal and minimizes the potential of a new pressure sore from developing. Reposition the Body Frequently – Changing body position at least one time every two hours can prevent most bedsores from developing. Use Devices That Assist in Repositioning – Some devices like a trapeze bar can be used by the individual for repositioning without causing shearing or friction to the skin. Use a Specialized Mattress – Foam mattress pads, special cushions and mattresses filled with air or water can assist the individual in repositioning to protect vulnerable areas and relieve pressure. Maximize Skin Care – Monitoring and protecting the skin is essential to prevent or identify developing Stage I pressure sores. Ensure that the skin remains clean using warm water and mild soap and protect the area with talcum powder. Change clothing and bedding frequently and manage incontinence to ensure the skin remains dry. Scientists have long known that there is a direct correlation between poor nutrition and the potential for developing bedsores. It is essential that the caregiver chooses a healthy diet for the patient and provide adequate liquids to ensure the skin remains hydrated. Another effective strategy requires the patient to remain active especially if limited in their mobility while asleep or awake.